Sundays are for realising the combination of a cold and jet-lag has prevented the Saturday night compilation of the latest Sunday Things. So in a way, this is late - and for the first time ever - but it's still Sunday. So things can't be so bad? 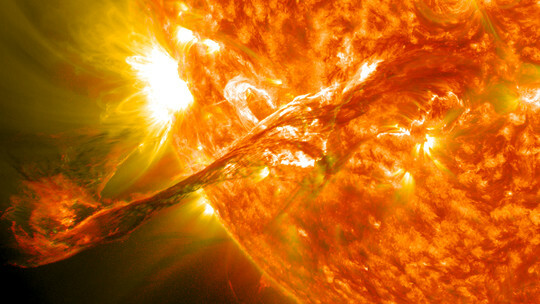 August 31st Coronal Mass Ejection - giant eruption on the Sun, imaged by NASA's Solar Dynamics Observatory. I'm only posting this 'cause anyone who somehow hasn't seen this already is seriously missing out! Extreme Instability - people's hero goes chasing storms in a car with a camera. I went through what looked like a weather front in northern France the other day - a huge bank of clouds with damp consequences on the other side. Atmospheric Optics - all those funny crepuscular rays, parhelia, supernumerary rainbows, halos and noctilucent clouds all have names, don't you know.